We’ve been told collecting and sharing reviews from happy clients is a great marketing strategy for years, but can showcasing published reviews help with website traffic and online reach? In recent years, search engines like Google® have started including 3rd party reviews as part of their algorithm signals and, even more recently, they’ve began to include 1st party collected reviews as one of their ranking signals. Why? Because, 84% of consumers trust reviews as much as recommendations from friends and family members. Search engines realized if online consumers were relying on these reviews to help make purchasing decisions then it just made sense to heavily consider this as a signal of trust and therefore include it in the ranking algorithm. How can business brands leverage consumer reviews online to reach marketing or search engine ranking goals? By developing an online review strategy, businesses stay better informed about conversations regarding their brand, can improve customer relationships, and drive traffic to your online resources. Although 80% of companies* believe they deliver great service & support to their customers, only 8% of customers* agree with those same companies. You need to ask yourself if you are taking the necessary steps in building a strong review strategy for your brand, and then answer that question honestly. Only a strong strategy will help your brand win new customers and business and strengthen existing brand loyalty with the positive momentum. We understand Collecting Reviews is Important to Your Online Strategy, but how is this accomplished? There are several strategies a brand can implement to encourage and manage reviews. 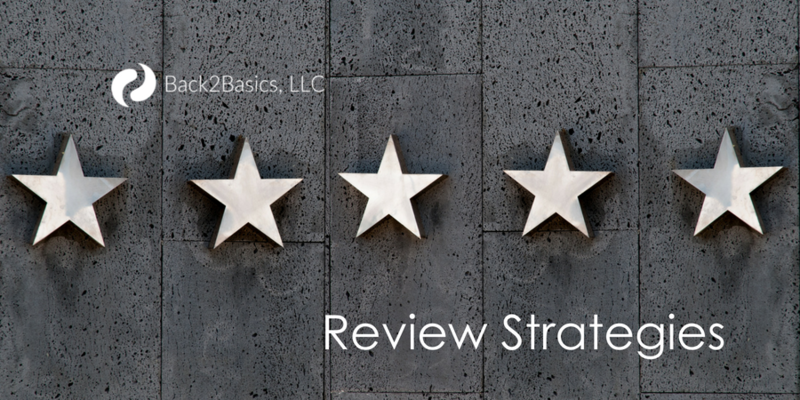 The best way to manage a review strategy project is to breake these down into micro-goals; one being the act of obtaining or collecting reviews and the other being the review and management of those collected reviews. What method(s) will you use to encourage online reviews of your brand? Consider your current client-base; the industry they work in, their personal interests, their lifestyles and personalities. Would this audience respond more to a personal plea and explanation of benefit to them for the review? An example of this explanatory approach might sound a little like this… “Obtaining current reviews of our work, services or products helps keep our online marketing budgets low which in turn allows us to use our budgets to enhance our services and solutions, or keep service costs low, etc.” Or, would your audience respond more to an instant-gratification approach? An example of this approach could be an offering of a discount on future services, a chance to win a prize, or a small thank-you gift. This approach is typically effective in a variety of situations, but is not applicable to every business due to regulatory restrictions. REALTORS®, for example, are not allowed to offer compensation in any form in the exchange of a referral to another potential customer as it would be a violation of RESPA. The compensation for a review, as a result of RESPA rules, is highly discouraged by a large number of brokers as a concern it walks the line. At the end of the day, it’s up to you to understand what is allowable and ethical, and you approach your business in a way you would expect another reputable business you work with to handle your business relationship with them. What form(s) of communication will you use to deliver your message of encouragement and call-to-action? Again, it’s a great idea to take a snapshot of your client-base and understand their personal preference of communication. If you understand their preference and utilize that forum in your outreach then the chances of whether or not your message will be seen and acted on is much higher. Examples of communication options would be personal messages through Facebook, direct email communications, text messages, or a hand-written note. In our experience, emails and text messages (or Messenger communications), where direct hyperlinks to the resources you’re collecting reviews in are more effective. What forums will you focus on collecting reviews in? In a previous life, recieving reviews in hand-written letters and then transcribing those (or taking snapshots of them and inserting them as photos/images) on your website was an effective way of marketing the satisfaction factor for your brand. However, these types of review are disregarded by search engines as unreliable references as they cannot be verified as coming from a legitimate and real resource. Therefore, collecting reviews in Google, Facebook, Yelp, Foursquare, or industry specific review sources is a better strategy. But, be ware, not all resources are equal when it comes to trust factor and how those reviews are ranked or showcased by search engine result pages. In addition to how reviews are seen in these results; some with star reviews and others just providing stats on numbers collected across the internet, we also see how reviews are used to help in the ranking of business brands in search results. And, although Google (among other search engines) will not reveal their ‘seo secret sauce recipe”, they have eleuded to the importance of reviews in the past two years and independent SEO industry giants have seen search results adjusted as a result of published reviews. How will you use collected reviews to encourage more interest in your brand or additional reviews from other clients? Showcasing these reviews on your website will add additional value to the readers and crawlers on your website. Sharing new reviews in blog articles, social media or email newsletters helps shine a positive light about the brand to potential new audiences and customers. No matter what method you decide to use, setup a system for sharing from the direct review resource rather than just copying and pasting these good vibes to your website and take advantage of the ability for a consumer to verify its authenticity and access additional insight about your business. That’s not to say, sending a copy in a printed newsletter or postcard cannot be effective, but we recommend providing a shortened link or QR code to link back to for additional information and drive traffic to your site or other business profiles and online assets. That online interest and traffic will also have a residual SEO benefit as a signal to the engine for brand interest. Just because you don’t participate in a particular website, social platform or forum online doesn’t mean your clients are not using and engaging in conversations there. And, if they are talking about yrou brand in any way, shape or form… you need to know and be able to respond. So, you need a proficient way to monitor converations about you and your brand. Setting up Google notificaitons is one step in the right direction, but this is just the beginning. Talking to a strategist liek the experts at Back2Basics can help manage this task and goal as well. One of the biggest ways for a brand to lose the faith of their audience is staying unresponsive to that audience. This loss in brand advocacy can also trigger a signal to search engines as well as they see lower review ratings or a drop in direct traffic to your business assets online. Those signals will result in lower rank positioning over time as well. Not all reviews will be 5-star rankings, but that’s okay. It’s how you respond to the writer that can make or break the trust in your brand. Jay Baer notes, if a brand takes charge and answers to forum complaints, advocacy can increases by an average of 25%*. However, if a brand does not answer these published concerns, advocacy can decrease by as much as 38%*. Recent studies support the “just ask” results — If a brand asks its customers to leave review about their recently used product or services, 7 out of 10 of those customers will. Of course, this rate varies across industry, geographic location and economic positioning. Even if you can get 3 out of 10 requests to act, you’re ahead of the game in most markets. 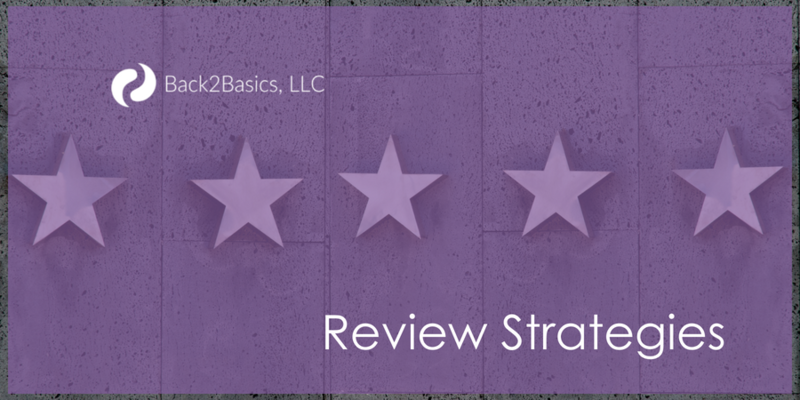 Back2Basics intimately understands collecting reviews is important to your online strategy and your business integrity. It’s why we recently partnered with industry leading technology experts Yext to build out, expand, and manage business brand integrity for small business owners. You can learn more about our services by visiting our Brand Integrity & Localization Solutions.